Bubbles of 2018 thru-hiker hopefuls have begun their long pilgrimage north. Some have already fallen to the wayside, while others press on through cold and wet wintry conditions. Meanwhile, Cole and I are watching with excitement and anxious anticipation, waiting for our departure date to arrive. We have not been idle. Most of our gear from last year’s hiking season has been revised and upgraded to lighter alternatives. We have been listening and learning as much as we can from seasoned long-distance hikers. Most importantly, we have been hiking. The mercury has risen (slightly), giving us a much-needed motivational boost to get out there and tackle some local trails. Added to this is a nervous restlessness growing inside of me that will only be dissipated through movement. So we hike. Four days per week, starting at 7.5 miles and zero pack weight, we have slowly increased our distance to 12.5 miles and our pack weight to 20 pounds. This still falls eight pounds short of what we expect our final pack weight to be. Hiking our local trails in southern Ontario. 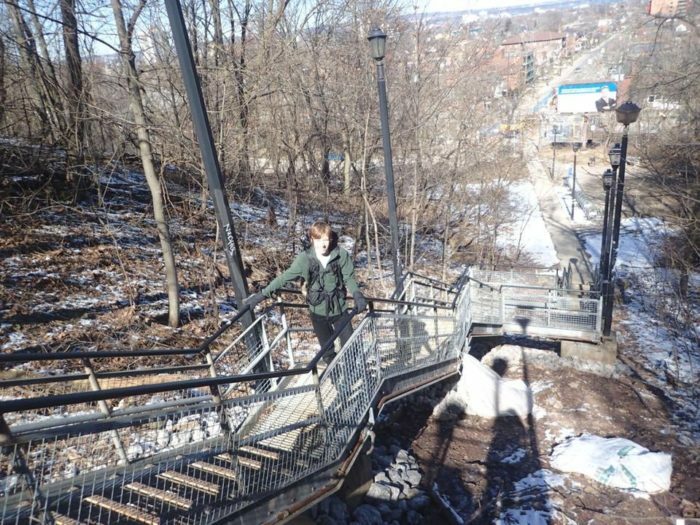 There are no mountains to climb in southern Ontario, but we do live on an escarpment with numerous stair access points. So we’ve been hauling our backpacks up and down 1,500 stairs on each outing. Hauling our packs up and down steps, 1,500 at a time. 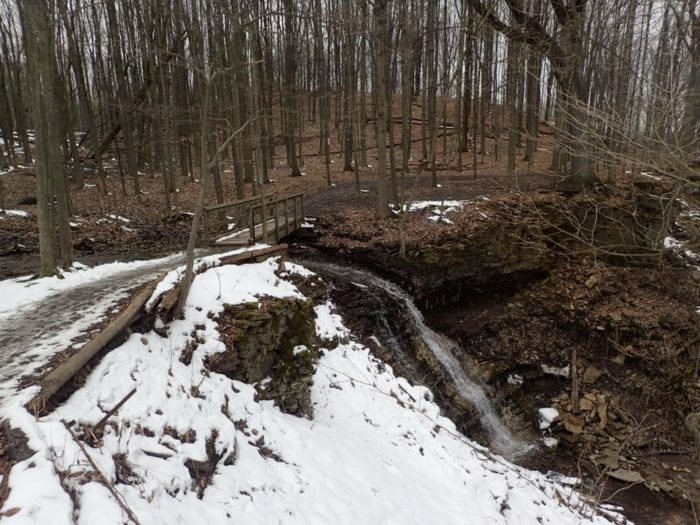 One of our local trails, the Bruce Trail, is marked with white blazes. With each outing we are toughening up and getting stronger. Despite this, when we hit the mountains in Georgia I am certain it will feel like we have not done any training at all. 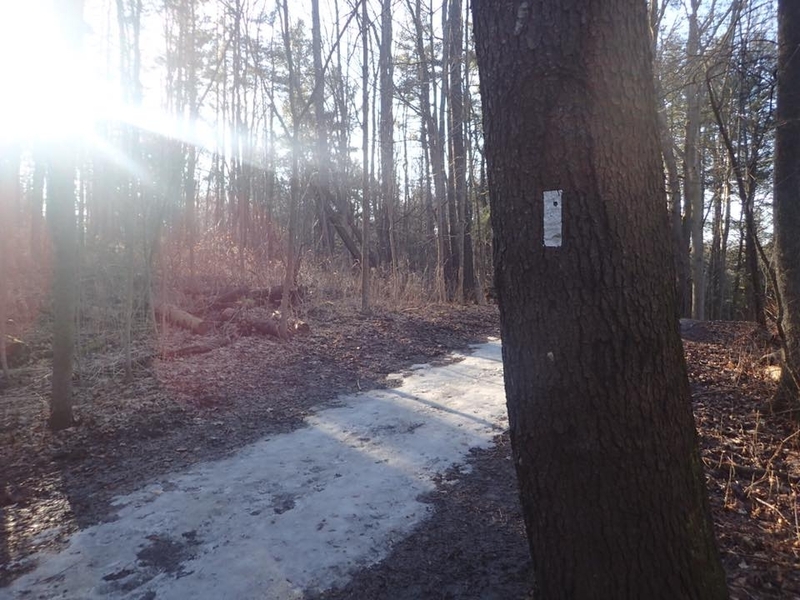 Our plan is to start slowly and let the trail complete the conditioning we have started. It’s a good plan. I like to plan. But has it been enough? Uh-oh. Here comes that nervous restlessness welling up again. I guess I’d better get back to the trails. We’ll see you in Georgia very soon. P.S. Please enjoy this brief trailer we created to announce our thru-hike to our family and friends. I too hiked with my son, he’s 23 and I’m 56. And we where on a time line. Best advice I can give is just enjoy the time together. Don’t try and keep up, wait for each other every couple hours, at technical sections or when blue blazing to a shelter or water. And don’t let the time get to you. Enjoy the time, take your time and just get as far as you get in 5 months. It doesn’t have to be Katahdin. It’s about spending time with your son not reaching a “goal”. We are off trail now (I’ll post my blog soon) and have no regrets. What an experience.